In Real Life will feature Mela Sarajane Dailey, Soprano and Martha Mortensen Ahern, Piano, presenting a world premiere of commissioned song cycle for soprano and piano by Grammy - ballot composer Robert Paterson and lyricist David Cote. "In Real Life" is about online dating as experienced by five extraordinary women: often humorous, sometimes heart-breaking. Robert Paterson and David Cote developed this piece specifically for Austin Chamber Ensemble's 35th Season and for Artistic Director and Pianist, Martha Mortensen Ahern and Mela Sarajane Dailey, soprano. At the end of the concert, audiences will have a chance to hear Paterson, Cote and the artists discuss the evolution of this work. Additional selections to fit the theme for Valentine's Day will be presented by Scott Wallace, Crystal Paull, and others who are featured soloists with 'Icons of Broadway' and 'Life in the City'. 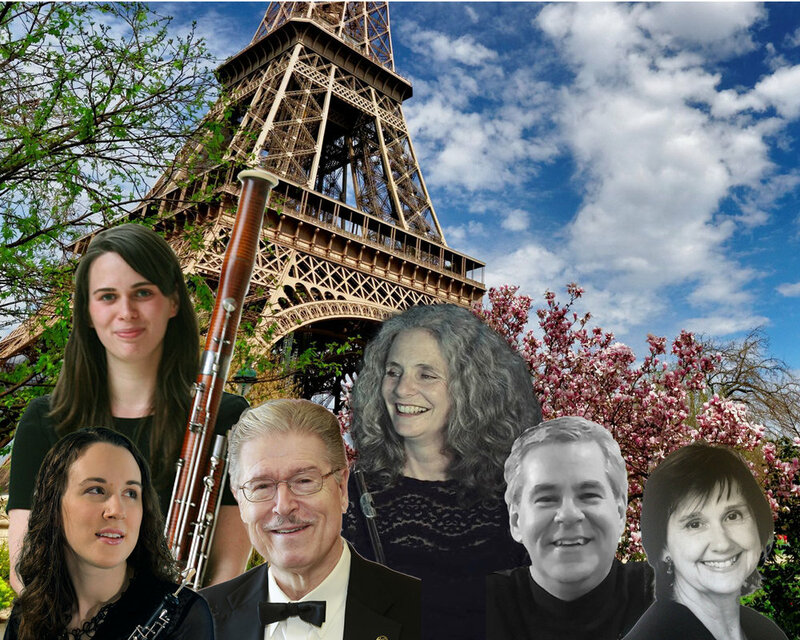 April In Paris will feature Austin Chamber Ensemble Wind Quintet (Barb Mahler, flute; Rebecca Haskins, oboe; Martha MacDonald, clarinet; Nicole Haywood, basson; Patrick Hughes, horn) and David Renner, piano. Included on the program will be works by Poulenc, Saint-Saens, Ibert, Pierre and Francaix. A 'guest pianist' will also perform "April in Paris" by Duke/Harburg as arr. by Count Basie. Community Outreach Event Takin’ It To The Schools will feature Martha M. Ahern, pianist and Katherine Altobello, mezzo-soprano presenting an interactive concert for school students. Repertoire will include everything from Classical, Musical Theater and Film. The two concerts in the schools are provided in part by a grant from Music Teachers National Association Foundation proposed by and awarded to Artistic Director, Martha M. Ahern. ‘Ladies Who Lunch’ Open Dress Rehearsal featuring Claire Vangelisti & June Julian, sopranos; Katherine Altobello, alto; Jeffrey Jones–Ragona, tenor; and Richard Seiler and Martha Mortensen Ahern, pianists. This innovative program weaves the lives of three women… An attentive, meddling and haughty waiter delivers candid commentary on the “ladies who lunch” – a seasoned socialite, a business woman, and a young bride. The ladies, and the waiter, articulate everything about their lifestyles and personas through a wide range of musical repertoire including operatic arias, art songs and musical theatre. While their individuality shines through, their lives become gradually intertwined into a cacophony of sound reflecting the frivolities of life, joy, hope, promise, disappointment, regrets, insanity, mortality, and ultimately, peace. Featuring Claire Vangelisti & June Julian, sopranos; Katherine Altobello, alto; Jeffrey Jones–Ragona, tenor; and Richard Seiler and Martha Mortensen Ahern, pianists. This innovative program weaves the lives of three women… An attentive, meddling and haughty waiter delivers candid commentary on the “ladies who lunch” – a seasoned socialite, a business woman, and a young bride. The ladies, and the waiter, articulate everything about their lifestyles and personas through a wide range of musical repertoire including operatic arias, art songs and musical theatre. While their individuality shines through, their lives become gradually intertwined into a cacophony of sound reflecting the frivolities of life, joy, hope, promise, disappointment, regrets, insanity, mortality, and ultimately, peace. Master Class by guest artist, Richard Dowling, presented with Austin District Music Teachers Association. Austin Young Music Ambassadors will have the opportunity to perform for Richard, with the emphasis on ragtime style. He'll share comments and give direction to the young artists performing.